It's not uncommon to hear that craps is one of the hardest games to get your head around, but it doesn't have to be. Although walking up to a craps table in the casino can be a harrowing experience, with the stickman yelling crazy stuff out that everyone else seems to understand, and the dice flying a mile a minute. No worries, all that talk is just slang trying to get the high rollers to place more bets. You needn't worry about the cryptic slang surrounding the game, or the craps board for that matter, as crazy looking as it is. Once you know the basics, craps much simpler to understand than you might think. Our craps guide will talk you through the major bets at the table, which are the only ones you're ever going to want to make, because the rest all have a high house edge. In fact, you can learn to play as well as the best at the table in about five minutes, seriously! The complicated bets and hedging that many craps fans enjoy are not actually advantageous to the bottom line. Playing the pass line bets, along with a small selection of other offerings, are the only smart bets on the board, and learning to stick with them may be the hardest part of learning to play craps. As you can see from our craps table picture, the middle and one end of the board are the only things which hold any significance. This is because of the fact that a craps table is double the length it needs to be, with each end being a mirror image of the opposite. 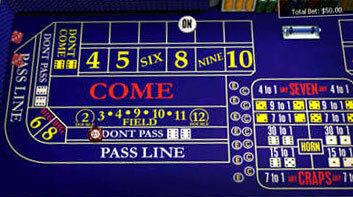 Craps players stand around the entire table in a land based casino and since everyone can be a shooter, the dice can be thrown from both ends of the table. Online however, craps doesn't need the extra end, which is nice for us because it removes some of the complexity from the board and makes it easier to learn. Like all good introductory craps instructions we will begin with a look at the fundamental plays and bets in the game, including the come-out roll and the pass line bet. To bet a pass line bet you place your chips physically on the pass line. Bets must be placed before the shooter lets go of the dice. The pass line is the wide band usually labeled with a capitalized 'PASS LINE' that runs along the outside of the table layout. To bet against the shooter you can place your bet on the don't pass line. As you can see in our craps table graphic, the don't pass line runs along the inside of the pass line and is noticeably narrower. The come out roll is the first roll of a new round, which usually means you have a new shooter (the dice are handed along in a circle to whichever bettor would like to be the shooter, as each session starts). If the shooter rolls a 7 or 11 on the come out roll and you have a pass line bet down, you win. If the shooter rolls a two, three or twelve, you lose. If the shooter rolls any other number, that number becomes the "point" number. If you're betting with the shooter (a pass line bet as opposed to a don't pass line bet), you want them to roll that number (the point) again before a seven is rolled. If that happens, you and the shooter win. If a seven is rolled before the point number is rolled again, you lose and the shooter loses. The process begins again when either a seven is hit, or the point is hit. So for the come out roll (the first toss for a new shooter), the shooter wants to hit a 7 or an 11 because it's an instant win. They want to avoid a 2, 3, or a 12 (collectively known as 'craps') because it's an instant loss. You want the same things if you are betting the pass line bet. A really fun aspect of craps is the fact that you can jump into the betting any time; the only exception to this states that you can't bet the "pass line bet with odds" on the come out roll - which is simply because you can only bet with odds when the roller is going for the point. A pass line bet with odds is a bet where you're putting additional money down on your pass line bet after the point has been set by placing an extra portion of money down just below your original bet (more precisely, half over the bottom bar of the pass line, so half on half off). This 'odds bet' pays off slightly higher than the 1 to 1 the pass line pays and so has a lower house edge. Basically, if you've understood this, you can learn how to play craps. The pass line bet with odds (sometimes called 'free odds') is the best bet in the casino, not to mention the game of craps. The more money you put down on 'odds', the lower the house edge drops. If the casino you're at lets you put 100 times your original bet down in odds, the house edge drops to an incredible 0.18%. The pass line bet without free odds has a house edge of 1.41%. For a look at each of the other craps bets read more here.